The next time you are at the grocery store, seek out a selection of colorful berries to add to your shopping cart. Blueberries, strawberries, raspberries, and blackberries are an easy, delicious way to protect your health. Berries can be found year-round, either fresh or frozen – you can even grow your own, and including them in your diet is effortless. They taste great and can be eaten for breakfast in oatmeal or added to a smoothie, tossed into a salad at lunch, or blended into a nutritious "nice" cream for dessert after dinner. Some dietary antioxidants, like vitamin C, work in the body primarily as antioxidants. The antioxidants in berries are different: The major antioxidant phytochemicals in berries are anthocyanins, in the class of flavonoids. These phytochemicals are concentrated in the skins of berries, give rise to their deep colors, are thought to have a number of benefits that are unrelated to direct antioxidant effects. Flavonoids do have antioxidant activity; however, their most powerful health benefits are thought to be due to their other biological effects. Berries and their flavonoids have been found to decrease oxidation of LDL cholesterol which helps prevent the production of atherosclerotic plaque, increase blood antioxidant capacity, decrease adhesion of inflammatory cells to vessel walls, and improve blood pressure regulation. Higher anthocyanin and berry consumption is associated with lowering an inflammatory marker called C-reactive protein, suggesting that berries may curb inflammation. The phytochemicals in berries also may enhance nitric oxide production in blood vessels, which helps to properly regulate blood pressure. Studies have shown that high flavonoid intake is associated with an up to 45 percent reduction in risk of coronary heart disease. 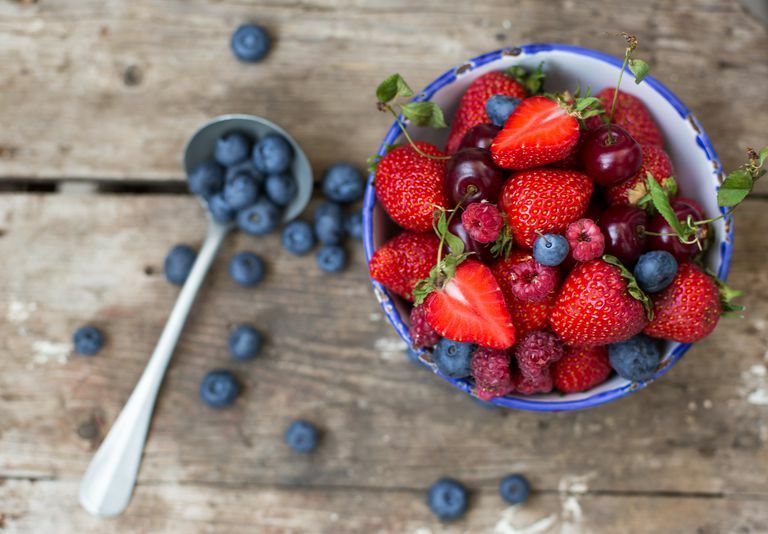 Nurses’ Health Study II data showed that young and middle-aged women who ate three or more weekly servings of blueberries or strawberries had a 34 percent reduction in heart attack risk compared to those who consumed a smaller amount of berries over the 18-year follow-up period. Furthermore, berries also have anti-cancer effects and provide protection against diabetes and cognitive decline with aging. Berries are the fruits with the highest nutrient-to-calorie ratio and an important component of a high-nutrient diet; I consider them to be superfoods. Along with greens, beans, onions, mushrooms, and seeds, berries make up G-BOMBS, which is the acronym you can use to remember the most health-promoting foods on the planet. These are foods you should eat every day, and they should make up a significant portion of your diet to promote health and longevity and to fight chronic disease. Basu A, Rhone M, Lyons TJ. Berries: emerging impact on cardiovascular health. Nutr Rev 2010, 68:168-177. Chong MF, Macdonald R, Lovegrove JA. Fruit polyphenols and CVD risk: a review of human intervention studies. The British journal of nutrition 2010, 104 Suppl 3:S28-39. Erdman JW, Jr., Balentine D, Arab L, et al. Flavonoids and heart health: proceedings of the ILSI North America Flavonoids Workshop, May 31-June 1, 2005, Washington, DC. The Journal of nutrition 2007, 137:718S-737S. Galleano M, Pechanova O, Fraga CG. Hypertension, nitric oxide, oxidants, and dietary plant polyphenols. Current pharmaceutical biotechnology 2010, 11:837-848.